What is Braedan up to? Stay tuned.. Our 2019 All in for Duchenne will be held Saturday, October 5, 2019. This years JettRide started at our house! 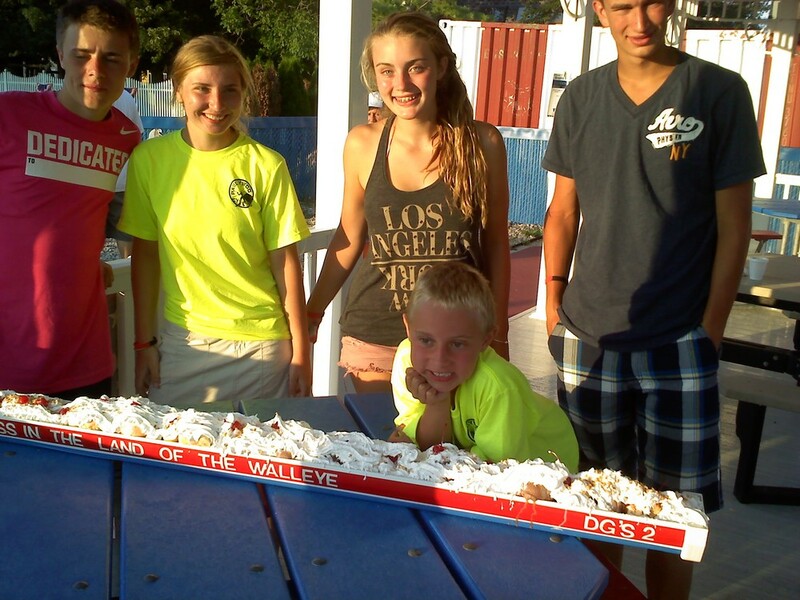 We had 8 teenagers and 3 adult leaders staying with us for 2 days having all kinds of fun! They swam, played soccer, fished and many other things entertaining. We had a great amount of support from friends and family to help keep them fed and we are so grateful for that. As always, we felt blessed and thoroughly enjoyed having them and are so grateful to them for taking 2 1/2 weeks out of their precious summer to ride to raise awareness for duchenne. 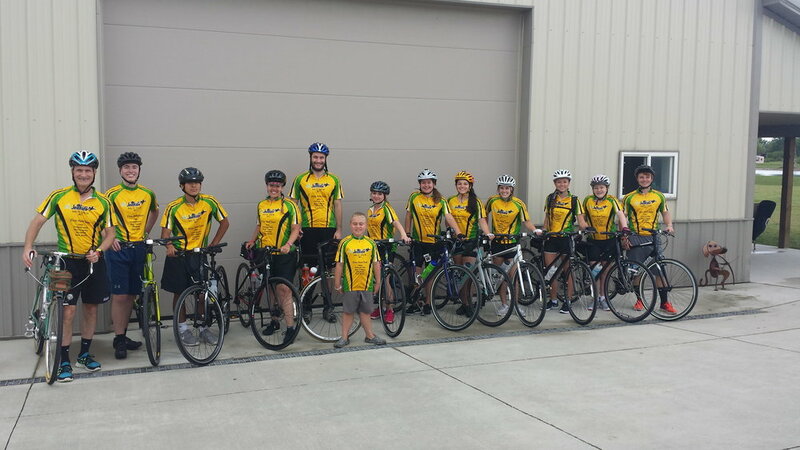 To follow along on their journey please see their blog at https://www.jettride.com/. If you are able to support them, please go to https://www.firstgiving.com/fundraiser/kaitlyn-gabel/jettride-2017 . Kaitlyn is our neighbor that is riding for Braedan. Our 2016 All in For Duchenne was a Great success with more in attendance then ever! It was a great night, with such wonderful family and friends supporting and Amazing cause. Once again, we can not thank our supporters and friends enough! You all give us such drive and hope that we can find a cure for duchenne. At the end of the evening, we are happy to announce that we are able to send $54,000 towards research. Thank you so much! "2016 ALL IN FOR DUCHENNE"
Tickets may be purchased by making a $100 donation on our site. Or Contact Tammy or Scott to purchase or information on how you can help make a difference. $100 per ticket per couple includes your admission, enters you in to the Reverse Raffle, dinner and drinks for the evening (soda, beer and wine) and a night out to remmeber! Tons of auction items and games to play. We have great surprises in store for our guests once again this year!! The 3rd Annual All in for Duchenne event to benefit Braedan’s Bridge was held Saturday, October 3, 2015, at Sylvania Tam-O-Shanter in Sylvania, OH. Braedan’s Bridge is a family founded non-profit organization established in honor of Braedan Henegar, who lives with Duchenne. More than 500 guests, wearing their favorite team jerseys, attended to fund research to find a cure for Duchenne muscular dystrophy. There was much fun to be had at the event- activities included a wooden horse race, a kayak give-a-way, silent auction, a money tree and even some special raffle items handmade by Braedan himself. Dinner was provided by every local’s favorite restaurant, Jed’s Barbeque and Brew. The fun and games were accompanied by a great deal of inspiration as several families of those with Duchenne came out in support of Braedan’s Bridge. Families who were unable to attend, from around the US, were honored via inspiring center pieces featuring Duchenne patient’s photos and stories. Local mom, Jen Dumm, spoke to the crowd about the clinical trial that has helped her son regain the ability to tie his shoes. Every person in the crowd was deeply moved by the cause. Special thanks to Scott & Tammy Henegar and all of the wonderful volunteers and attendees who make All in for Duchenne a night to remember. Our family once again hosted the Jett Riders on their amazing journey across the country to raise awareness for Duchenne. This years ride was truly an across country journey traveling from Bloomington MN to Point Pleasant Beach, New Jersey. Every year, we enjoy riding with them and hosting them. This year Bob and Tom Sulfaro (42 years old with duchenne) and Tim, Sue and Travis Coll joined us in welcoming them. 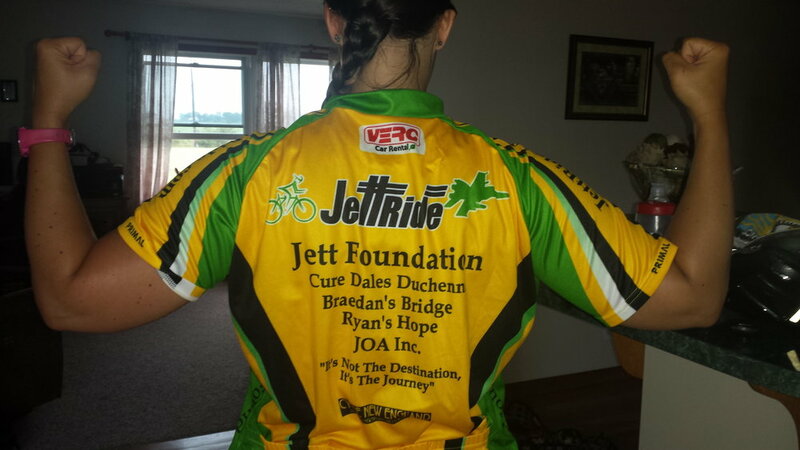 Thank you Jett Riders and The Jett Foundation for doing what you do! It's groups like you that really help us spread the awareness and our boys love it when you visit! SCRAP 5K Run that Braedans Bridge and Relay for Life we very grateful to be the chose charities for. Our 2nd Annual All in for Duchenne Dinner/Reverse Raffle was a Huge Success this year. We had a great turn out of amazing friends and family this year. the night was filled with lots of games, auction items, great food and drinks, and even some emotions. We had special guest Sarah Burgess, 2007 American Idol finalist , and Huge supporter of finding a cure for Duchenne. She graced us with singing her song that she wrote in honor of her brother, Jacob called "Spoken Word". It was such a beautiful song and left not a dry eye in the room. Sarah's little brother also has duchenne and she is fighting this horrible disease as well. Our friend Tom Sulfaro also got behind the mic and shared with us a little about his journey. You see, Tom has duchenne and he is one of the very few that have beaten the odds against him. Tom is 42 years old and has been an incredible inspiration to many. A special thank you to Sarah Burgess and Tom Sulfaro for making the evening a very touching night. We would also like to thank all of our family and friends that helped us with the planning, organizing, supporting and running this event. We could not have done this with out you and we are incredibly grateful to you always. We rely on many people and businesses on donations as well, and we would like to thank everyone that made a donation. With out your support we could not have been such a success. We believe that this event is a way to raise great funding and awareness for duchenne and 100% of all the proceeds that Braedans Bridge brings in is donated to duchenne research. Together with the help of all that have supported Braedans Bridge, we will continue to raise funding and awareness until we take down this disease once and for all. Powered by Braedan's Bridge, Inc. EIN 45-2319049. Content used with permission from Braedan's Bridge, Inc.